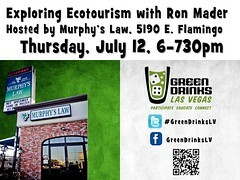 Las Vegas - In July Las Vegas Green Drinks served up a refreshing talk on ecotourism and social web. Planeta.com's Ron Mader was the featured presenter. The free event drew a diverse crowd at Murphy’s Law. Via the social web, the talk was announced on Facebook and livestreamed through web video. Phase Two of Planeta.com's Las Vegas coverage includes more innovative uses of open journalism, amplifying local causes via Facebook, Flickr, Foursquare, Twitter, YouTube and the Planeta Wiki. 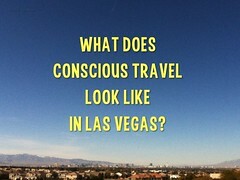 What does green, conscious, responsible travel look like in Las Vegas? Create it, look for it and please show us!